Just give free-market ideology a few seconds of your time and you, too, can join the 1 percent! Quit whining, American poor people and refugees from the middle class. You’re actually part of the 1 percent. So, people, think global and act grateful—because you could be eating mud cakes in Haiti. But let’s get real. A household income of $34,000 for a family of two parents and two children in America is close enough to the poverty level to qualify that family for federal subsidies, like food stamps. And according to the Economic Policy Institute, that family would need an income of $48,144 to cover its basic living expenses in Marshall County, Mississippi, one of the cheaper places to live, while $53,721 would keep it above water in the more expensive Wichita, Kansas, where Koch Industries is headquartered. And those overly entitled refrigerator owners are undoubtedly the same folks who think they’re entitled to vote (to Supreme Court Justice Scalia, the Voting Rights Act is a “perpetuation of racial entitlement”) or to walk home with Skittles without being stalked and killed. Of course, the Koch ad isn’t really directed toward the poor or the middle class. It’s geared to the corporate elite, lobbyists and legislators to help them better rationalize their crusade to kill minimum wage increases, voting rights, Obamacare, environmental protections and other nuisances. Shockingly, but not surprisingly, the GOP-controlled House voted Thursday to completely eliminate funding for food stamps from the Farm Bill. The right doesn’t just want to starve the beast, it wants to feel morally upright even if it starves hundreds of thousands of souls along the way. Charlie Koch’s 1 percent solution is only the latest excuse for this politics of cruelty. It’s like the right’s fake fretting—cue the violins!—that deficit spending “steals from future generations” (even as they steal from non-hypothetical children today), or that government assistance creates “a culture of dependency” (even as Koch Industries, to take one example, receives federal oil subsidies, government contracts and bailouts). The power to delude is apparently stronger than the power of economic freedom. Charles Koch told The Wichita Eagle last week that he’d be “raising up the disadvantaged and the poorest in this country” by ridding them of a minimum wage. What we’re saying is, we need to analyze all these additional policies, these subsidies, this cronyism, this avalanche of regulations, all these things that are creating a culture of dependency.… [the government keeps] throwing obstacles in their way. And so we’ve got to clear those out. Or the minimum wage. Or anything that reduces the mobility of labor. But let’s get to the ad’s dubious, underlying claim that “across the board we see a strong relationship between economic freedom and people’s quality of life.” Like “the 1 percent,” the meaning of “economic freedom” and “quality of life” depend on who’s defining them. From the corporate and libertarian point of view, economic freedom essentially means the absence of regulations. From the vantage point of workers and the unemployed, it means, among other things, the education to get a job, the transportation to get to a job, safe and nondiscriminatory working conditions, and a living wage. That’s economic freedom. 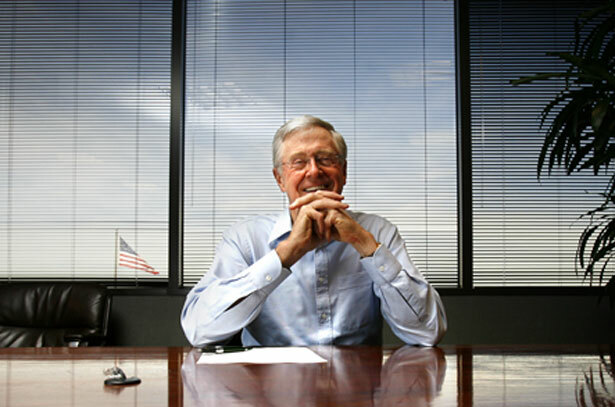 One small way to protest the Koch way of reframing reality is to sign this petition, asking PBS stations to air Citizen Koch, a film exposing how big money rules American politics. Public TV execs were ready to run the film—until they freaked out that it might cost them funds from PBS-donor David Koch. But now that you’re part of the 1 percent, PBS will surely cave to your influence, too.